If there's something strange in your neighborhood, if there's something weird and it don't look good, who ya gonna call -- on your smartphone? "I really like those different paranormal television shows where all these ghost investigators carry around expensive electromagnetic field (EMF) detectors and various other tools," Ghost Radar designer Jack Jones told The Huffington Post. We use our iPhones, Blackberries and Androids mainly to communicate -- by calling, emailing and texting (and sometimes surfing the Web). But these ubiquitous devices are also loaded with tons of high-tech extras, like advanced digital cameras, GPS features and accelerometers that can do everything from replacing your tools to checking your glucose levels. Why can't they also search for ghosts? "When I got into mobile phone application development, there were no paranormal applications out there, so I created Ghost Radar and mine was the first -- nobody had ever done anything like that," Jones said. If the spirit moves you to download Ghost Radar, the app will purportedly scan your surroundings and establish a baseline of ambient noise, vibration and other factors. Then it waits for something to happen. "The Ghost Radar looks at readings that the phone can detect, based on the GPS or the FM receiver that's built into all these phones -- if there's any fluctuation of the baseline, it's hoped that there's a paranormal entity out there that can manipulate the sensors on the phone so that it could somehow communicate. That was my intent," Jones said. The app includes a database of about 2,100 random words, which pop up on the screen from time to time. Jones said if the app really works -- and users are somewhere that's really haunted -- the spirits will choose words and communicate. Some paranormal researchers see apps like Ghost Radar as a means of democratizing their practice -- giving powerful tools to anyone with a smartphone and about $1 to spend on an app. 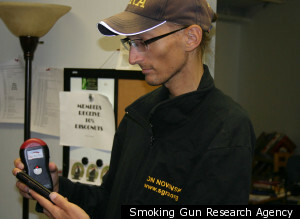 "I honestly didn't think a phone could have the capability of doing something like that," said Jon Nowinski, director of the Smoking Gun Research Agency (SGRA), a group dedicated to studying the paranormal. "One of the problems that we face in paranormal investigations is that it's very difficult to record everything." "Some of these apps not only record things to the phone, but a lot of them have the ability to actually export those files so that you can start analyzing them on computers as well," Nowinski (image below) told The Huffington Post. Skeptics and naysayers may say "boo!" to the idea that a hand-held device, normally used to communicate with other humans, can also be used to dial up the dearly departed. On his website, Jones notes that the Ghost Radar "cannot be verified scientifically and therefore should be used for entertainment purposes." But supporters of the apps are hoping they're the real deal, or at least another tool on the ghost hunter's utility belt. "When we do an investigation, we go in blind so that most of our team doesn't know anything about the history or even talk to the client, so that they don't have any pre-notions of things," Nowinski said. "On one of our investigations, the app listed 'baseball,' 'bedroom' and 'staircase.' To us, that didn't honestly mean anything, but the client felt those specific words were related to a spirit that was there." Nowinski will demonstrate the various paranormal apps at SGRA's ParaCon 2011 convention this weekend in Connecticut, where the theme is "What Do You Believe?" Chances are, you have to be a believer to believe in these apps. "I definitely think there are things that we don't know and things I can't explain," Jones said. "I've never seen a full apparition walk in front of me, but I'm certainly open to the idea that there are things around us that we don't know about." An iPhone might not look like much of a ghost-hunting tool -- but that's only fitting, from Jones' point of view. "I'm open to the idea that things are not necessarily the way they appear."